Hair loss is not just something that happens to older people, at can happen at any age and is affected by a lot of different factors like stress and diet. Reducing the stress in your life is not always the quick fix you’d like it to be, but changing your diet can be. Here are some foods to start incorporating into your diet that will supporting hair growth as well as keeping the hair that you have. Your hair and nails are made from a protein fiber, so it makes sense that you need to be eating enough protein to pass it along as a building block. 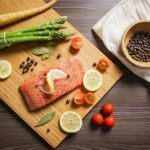 Salmon is one great choice as a protein because it’s also a great source of omega-3 fatty acids, which also have a hand in protecting hair growth. Some studies have found that people who experience sudden hair loss can be low in iron. As you probably know from the Popeye days, spinach is a good source of iron. But not only that, it is also a good source of vitamin C, and vitamin C helps in the absorption process that is crucial to get that iron into a usable form in the body. Beta carotene has the helpful power of stimulating the scalp to release sebum, aka oil. While many people do what they can to avoid their natural hair and skin oils, the body actually produces them for a reason, to help protect and soften the hair and skin. The healthier your hair is, the less likely it will be to thin and break off from other factors. Sweet potatoes are a great source of beta carotene, as are carrots, pumpkin, cantaloupe, and mangoes. Oysters are a great source of zinc which is another mineral that can help with hair loss. One study found that people who suffered from alopecia hair loss were more likely to be low in zinc, and that adding it to the diet can help stop hair loss pretty quickly. Other good sources of zinc include oatmeal, eggs, spinach, and walnuts. Seaweed is basically a vegetable of the ocean, but being from the ocean makes it a lot higher in certain vitamins and minerals. It’s a great source of calcium, omega-3 and omega-6, vitamins A, B, C and E, and can be a good source of iodine, iron, phosphorous, potassium, copper, manganese, porphyran, and zinc. All of those things can help increase hair growth in different ways. One study found that men who took a supplement of pumpkin seed oil over a course of 24 weeks experienced a 40 percent increase in their hair growth. That’s a pretty significant amount. Other oils might even be helpful to use directly on the scalp. Coconut oil has been found to help protect the hair, and rosemary oil has some properties that make it almost as effective as Rogaine when used directly on the scalp in a similar manner. Shitake mushrooms might have another helpful benefit for keeping your hair looking great…the copper in them has been shown to help hair maintain its natural color longer. (Regardless of what that natural color is.) One study suggested that when people grey prematurely it sometimes has to do with low levels of copper in the diet. Shitake mushrooms are an awesome source, as is seaweed, and even sesame seeds.